eBay FREE SHIPPING SALE GOING ON NOW!Customers1stGaming GUARANTEE:Customer Service is our Priority! 30 Day Hassle Free Return policy! We don't cut corners on quality. We only sell AUTHENTIC games. Also, our store has been approved to be a part of the eBay Guaranteed Delivery Program. Only select sellers are approved for this program so we can GUARANTEE our delivery dates or you will get an eBay credit toward your next purchase! In most cases, we even beat the guaranteed delivery date because we try to ship same day.Priority Mail Shipping + Insurance and Tracking Included!All items have been thoroughly cleaned and detailed. Every console is opened up, blown out with compressed air, and wiped down inside and out! Yes, we do this for EVERY console.Console:-Original charcoal Console with Jumper Pack, Power Cord, and AV Cord.Controller Options:-Choose up to 4 NEW CONTROLLERS made by TTX. (SAME DESIGN, SHAPE, AND FEEL AS YOUR STANDARD N64 CONTROLLER)Solid Colors: Red, Blue, Grey, Green, Black, Yellow/BlueClear Colors: Ice Blue, Jungle Green, Atomic PurpleYou may choose your controller colors, but they are subject to availability. If you have a preference, please message me before you purchase. We will do our best to accommodate your color preference.We have used 10+ varieties of controllers. We have determined that the controllers we use are most comfortable and have tight sticks, while maintaining proper stick sensitivity. Most other aftermarket controllers are too sensitive, too stiff, or just poorly made. Trust us, and if you don't agree, return everything for a full refund! All items may have light/minor scratching, scuffing, etc. TESTED AND GUARANTEED TO WORK!Other Add-on Options Feel free to purchase Expansion Packs, Tremor Packs, Rumble Packs, Memory Cards, or any other accessories that you can find in our store to go along with your Nintendo 64 System!Some newer smart TV's may require an AV to HDMI converter to be compatible to the TV. 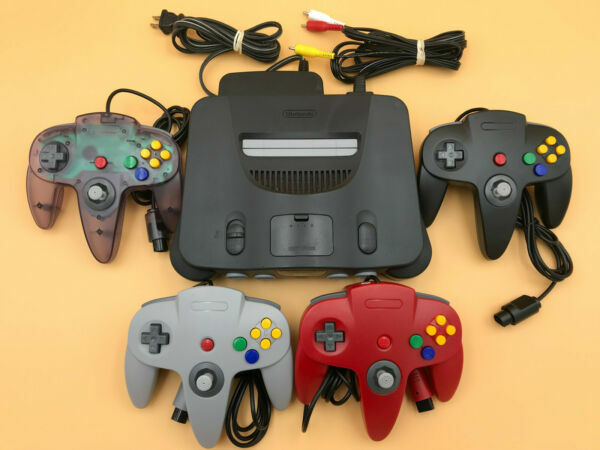 This is not the case for every TV, but if you feel that converting the signal to HDMI is a better option, then an AV2 HDMI converter may be the best option for you!The expansion pak is required to play Donkey Kong 64 and The Legend of Zelda Majora's Mask. The expansion also improves the graphics of many other N64 games. I do not currently have expansion paks, but you can find them here on eBay if you want one!